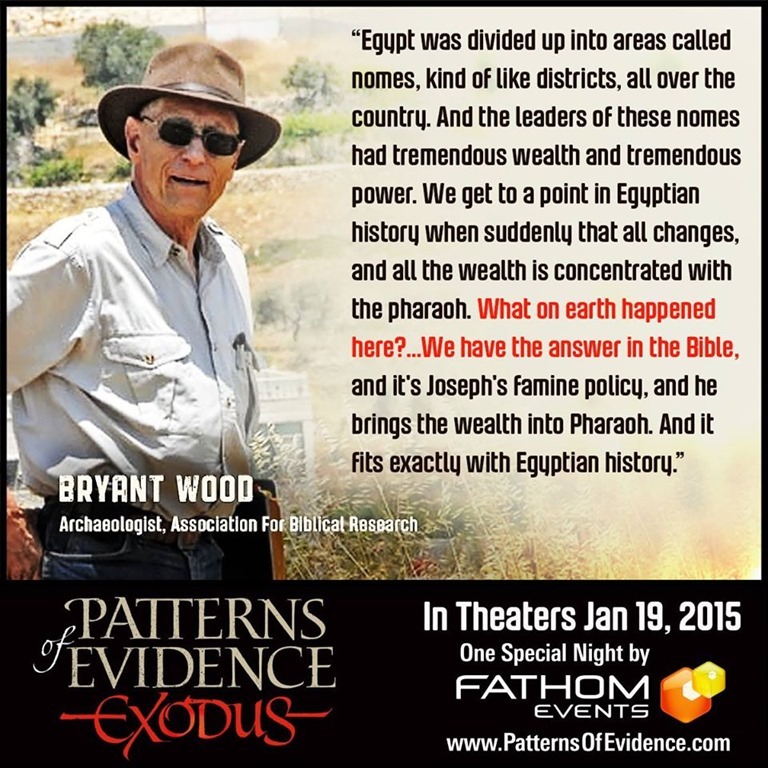 I told you last week about a new documentary, “Patterns of Evidence: Exodus,” which made the case that if you alter ancient Egyptian and Middle Eastern chronologies by 200-300 years, archaeological discoveries fall into place in a way that shows the Old Testament stories of Joseph, Moses and Joshua really happened. It only showed once in the theaters; here in Lexington, KY the cinema was not quite half full, so I had no trouble getting a ticket. I greatly enjoyed the movie; you got to hear what all the archaeologists, both pro and con, had to say about the subject. A thirty=minute panel discussion followed the movie, hosted by Gretchen Carlson of Fox News. Anyway, the movie did well enough that there is going to be a second show, tomorrow, January 29, at 7 PM, in more or less the same theaters. If you missed it the first time, now’s your chance to see it. Mark your calendar and book your tickets now! 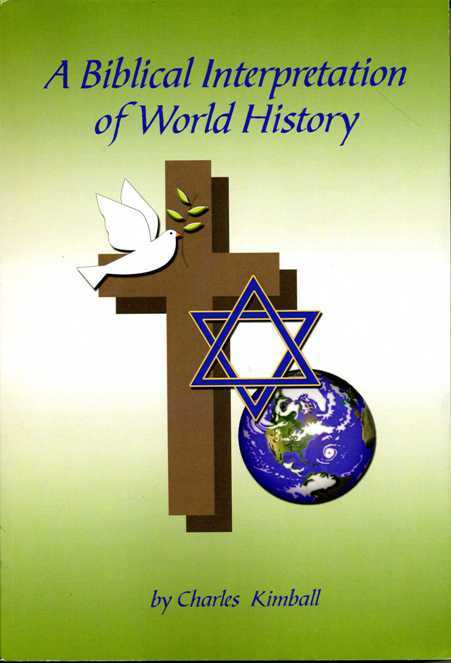 Over the years I have posted updates here regarding David Rohl’s “New Chronology,” which promises to rewrite what we know about ancient history. 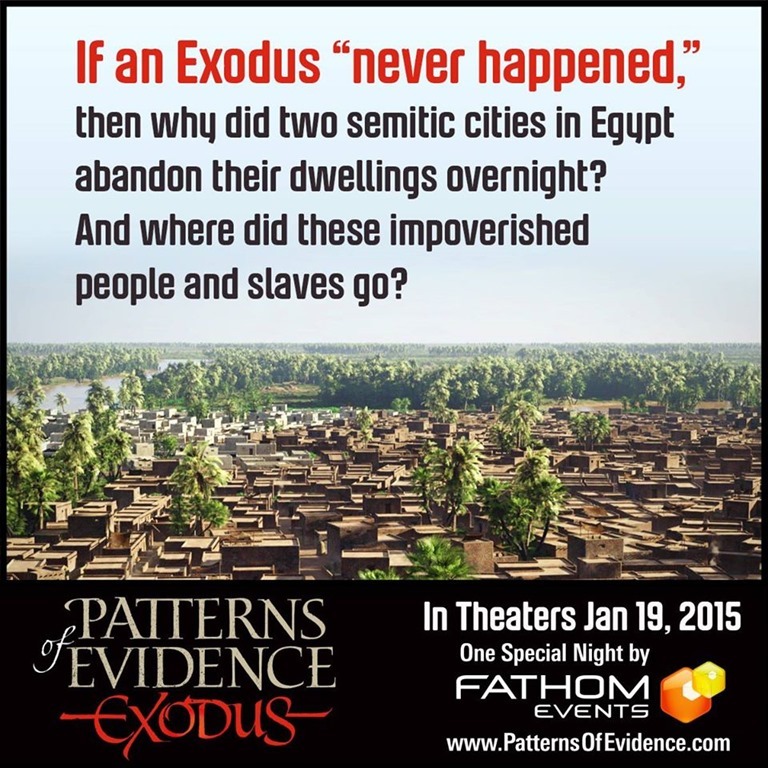 The latest is a new movie, called “Patterns of Evidence: Exodus,” which puts forth the case that the Biblical stories of Joseph, Moses and Joshua really happened, but archaeologists did not find evidence for them because they were looking in the wrong place. Or to be more exact, the evidence was in the right place, but they were looking in the wrong time; it is centuries earlier than when they expected. Now watch David Rohl and others make the case that evidence has been found for these stories, but it wasn’t recognized as such, until recently. Unfortunately there will only be one showing of the movie in theaters, at 7 PM on Monday, January 19. That’s tomorrow as I write this. David Rohl is a friend of mine on Facebook, and he told me personally that although this is a quality production, it was not made by a big-name Hollywood studio, so they couldn’t get many places to show it. Here in central Kentucky, for example, it is only appearing in three cinemas, one of which is three miles from my house, fortunately. Now the producers are hoping it will be popular enough for them to make a DVD out of it. I’m plugging the movie here because I have friends and relatives who can’t go tomorrow, so the DVD will be the next best thing for them. Maybe I’ll see you in the theater tomorrow! 9. The United States established its first tank corps in 1917, and the first American soldier to join was an officer we’ll be hearing a lot from in the next war, then-Captain George S. Patton. Patton guessed that he would be seeing more action with the newly invented armored vehicles than he would if he stayed with the infantry. Before the year was over, Patton, now a colonel, was sent to find a good location in France for a tank training school; he decided a village named Bourg would do, because it had lots of mud to practice driving in. While there, the mayor of Bourg came to him with tears in his eyes, because he had failed to tell Patton of the American soldier who had died in Bourg. Patton quickly checked, and found that no one in his unit was dead, but the mayor insisted that he at least visit the soldier’s grave. The mayor proceeded to take Patton to a mound of dirt with a stick posted in the ground at one end. Nailed crosswise on that stick was another piece of wood with the words “Abandoned Rear”; evidently the French had mistaken the sign for a cross. It wasn’t a grave but a recently closed latrine; the dirt and the sign had been left by the last person using it! 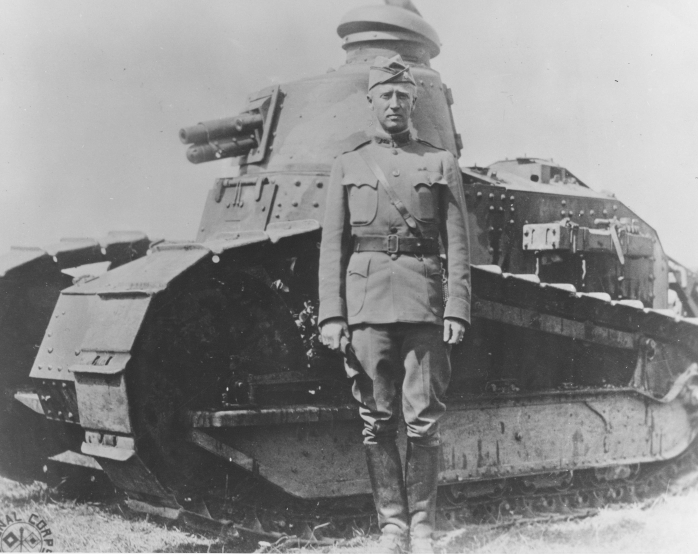 George S. Patton with his FT-17 tank, summer of 1918.